Cocaine is made form the coca plant, originally used as a pain killer in the United States. 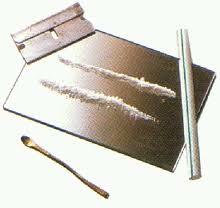 Classified as a stimulant, most often cocaine is in powder or crystal form and can be sniffed, ingested , rubbed on the gums, smoked or injected. Cocaine is never pure and usually mixed or "cut" with several varieties of substances including: corn starch, talcum powder, sugar or other drugs like procaine or amphetamines or even deworming medication for animals. The mix of compounds is never certain and you never know what you are getting. Short-term cocaine is one of the most addictive substances we know of. After using there is a short-lived and intense high followed by a dramatic drop or depression. We like to call it the "what goes up, must come down effect." Other effects include: depression, increased heart rate, abnormalities in sleeping and eating patterns, muscle spasms, convulsions, paranoia, easily angered, anxious or hostile. regardless of usage there is always a risk for heart attack, stroke, seizure or respiratory failure. Long-term effects of cocaine are severe tolerance and addiction, deprivation and loss of appetite leading to malnutrition, psychosis, hallucinations, interference in brain activity, loss in interest in regular life activities, depression and suicide, high blood pressure, liver, kidney and lung damage, destruction of nose tissue, tooth decay, infectious diseases, weight loss, sexual problems & mood disturbances.